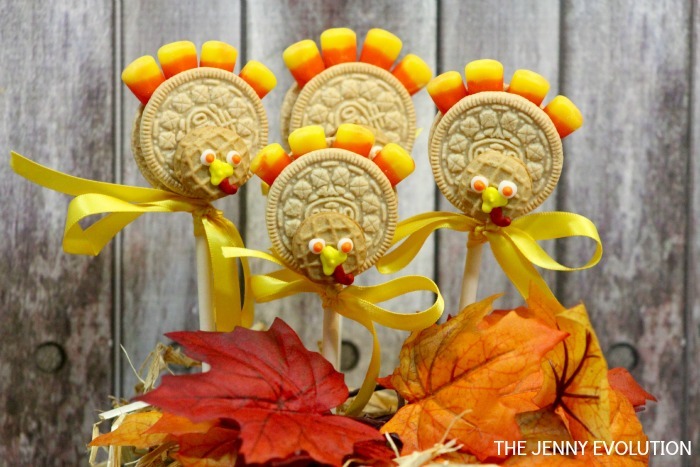 Your kids are going to flip over these absolutely adorable Oreo Cookie Turkey Pops. Thanksgiving is all about family, friends and FOOD. 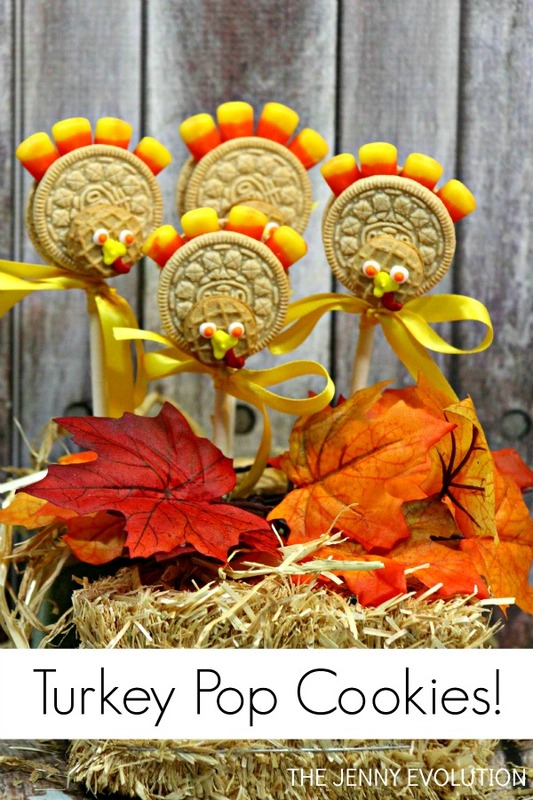 Why not give the kids an extra special treat this season by making these Thanksgiving Oreo Turkey Cookies. They’re so much fun to eat –right off of the stick! This post contains affiliate links. Separate the vanilla Oreo cookies. Place the half of the Oreo cookie with the filling on it on a plate. Add a layer of white royal icing* on top of the cookie filling. Place four pieces of candy corn with the white end of the candy corn on top of the royal icing. Place the candy stick on the icing until almost touching the candy corn. Put the top half of the Oreo cookie on top. (if needed add more icing to level to the top cookie). Allow to dry 1 hour before standing up. Add the mini Nutter Butter cookie on top of the Oreo cookie. Use the white icing as the glue to hold the mini cookie to the Oreo Cookie. Add a small dot of white icing as the eye on the mini nutter butter cookie. Place a tiny orange icing dot (eye ball) in the center of the white dot (eye). Add three tiny yellow icing dots, touching each other, for the nose. Add a red icing for the waddle. Allow to dry for 5-10 hours. Tie a bow around the candy stick. If icing is not stiff enough add 1/4 C powder sugar. Spoon the icing into a bowl (#1). Take out 4 TBSP of icing add several drops of orange gel food coloring. Mix well! Spoon the icing into a bowl (#2). Take out 4 TBSP of icing add several drops of yellow gel food coloring. Mix well! Add several drops of red gel food coloring in a bowl (#3) of 4 TBSP of icing. Stir well to mix the color. Keep the rest of the icing as white. Spoon the different colors of the icing into Individual pastry bags with a #5 tips. Twist the open end of the pastry bag to force the icing to the tip. Don’t miss out on my other Thanksgiving family fun ideas for all ages (including grown-ups)! 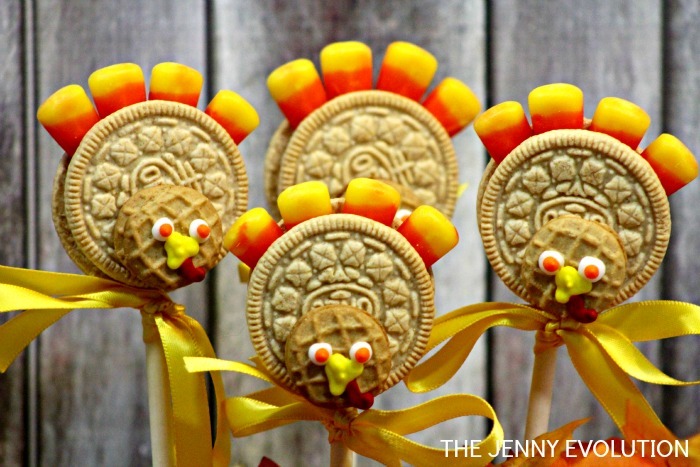 Kids (and adults) are going to flip over these absolutely adorable Turkey Cookie Pops. If icing is not stiff enough add ¼ C powder sugar. So cute! I know some little ones who would just love these 🙂 Thank you so much for sharing with us at Snickerdoodle Sunday. Pinning to share! What a festive idea! They came out so cute! Adorable! I love these! I have never made royal icing, but I need to! Ohhh! These are so adorable! Thanks for sharing at Fiesta Friday party! These are SO adorable Jenny! 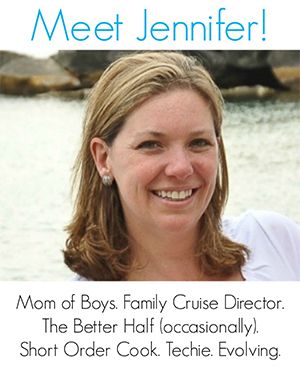 Congrats – you are one of our featured guests at Inspire Me Monday at Create With Joy! Wow, these are so cute! I just love them! Everyone is going to love these over at Fiesta Friday! Thank you for sharing and Happy Fiesta Friday! 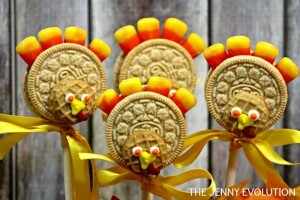 Your Turkey Pops are just adorable! Thanks so much for sharing your special post with us at Full Plate Thursday this week. Hope you have a great week and come back to see us real soon! Congratulations! Your post was my feature pick at #WonderfulWednesday this week. Visit me at https://www.marilynstreats.com on Wednesday evening and to see your feature and grab your badge! All hosts choose their own features from the comments left on their blog so be sure to return to my blog for your badge. I invite you to leave more links to be shared and commented upon. Please be sure to leave your link number or post title so we can be sure to visit! These look super cute. Thanks for the idea.